When the cold wet winds of late October starts to blow, the time has once again come to review your closet's knitwear supply. 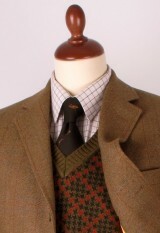 A lambswool or Shetland vee-neck jumper makes a perfect companion to your favourite autumnal tweed jacket. Just make sure the vee-neck is deep enough to show some shirt! High quality clothing and footwear reward their masters by aging with charm. Do not fear some patina, or even lots of patina for that matter. The patina adds to your personality, and gives you a relaxed air of experience. 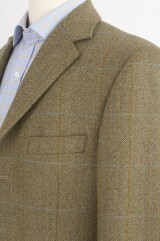 There is a rather widespread belief that according to The Rules a gentleman cannot wear tweed when in town. Nothing could be more wrong. As always the only rule to follow is to dress proper for the occasion and for the company one expects. There was a question to the leading expert of etiquette in Sweden Magdalena Ribbing that, judging from the comments, seemed to create some confusion. Of course, Mr. Tweed hastily offered his assistance. The question regarded how to interpret the dress code Country Elegance for a late August garden party. Here is what Mr. Tweed has to say about it! When invited to a shooting party, dressing up is half the fun. And picking out a nice tie to match your well worn tattersall shirt and your trusted tweed shooting coat leaves room for some eccentricity. 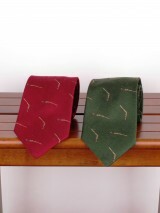 This is indeed an opportunity to excel in embroided pheasants, mallards and foxes. On the other hand we have those utterly tasteful woven and knitted woollen ties that go so well with subtle country tweeds.